Just a shorter post this week. I have been going through some difficult changes personally – including a reorganization of my Sunday schedule. The result is that my rhythm is off, but normalcy is returning. If you recall, last time I wrote about scripture study, and I started off by reading the Lord’s promise to teach us if we will come to him. This week, I want to look at that same scriptural promise, but with a slightly different light. Specifically, I want to look at the Lord’s promise to ease our burdens if we will come to him. 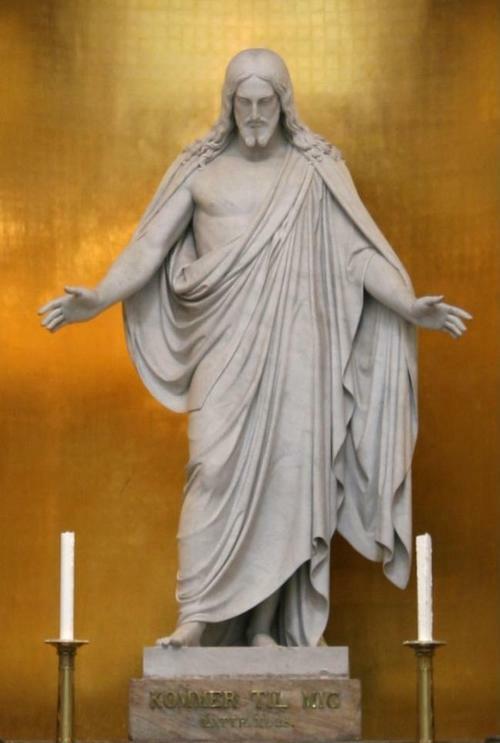 The picture of the Christus statue in Copenhagen, Denmark that I chose to start this post has this same reference on it. Perhaps this is the reason our Church has reproduced and adopted so frequently this wondrous image of the Savior. He stands there with his arms open, not hanging and suffering, but rather waiting to receive each of his faithful followers. Looking at this story in more detail, we see that, because the Savior was preaching a radical message, namely that it was not against the commandment to performs acts of service on the Sabbath, that the Pharisees sought to destroy him. As Jesus had previously pointed out, religious service was a type of work, but because it was ad majorem dei gloriam it was permissible (see Matt. 12:5). Anyway, after this preaching, the scriptures tell us that the Pharisees held council to destroy Jesus. And here is where the story actually starts. When Jesus heard of the machinations of the Pharisees, his reaction was, of course, to retreat from the area of trouble. But notice what happened: the multitudes followed him. And, as was his wont, Jesus healed all those who came to him. And, as usual, Jesus instructed these people not to tell what had been done for them. And this is the odd part. In church, all our lives we have thrown around the idea that Jesus did not preach to the Gentiles. Yet, here, Matthew is saying that this preaching to and healing of the Gentiles is a fulfillment of this very prophesy? Personally, I think that this is saying, plain and simple, that Jesus DID preach and minister to the Gentiles. Of course, he was sent to minister to the Jews, but this is one example of Jesus ministering to those outside of the House of Israel. We do not know anything about these Gentiles…they could very-well have been the children of Abraham through one of his other seven sons, or through Esau…or they could have been some other Gentile tribe. But it doesn’t matter, because the scriptures are saying that Jesus preached to and healed these Gentiles. What do we know about these Gentiles? Only one thing: they followed Christ. When he was rejected by the Jews, he allowed the Gentiles, the non-chosen, the same chance to experience the love of the Son of God. As he promised to all, when they followed him and learned of him, they found rest to their souls. I would also like to point out a few comparisons between Matthew’s version of this scripture and the “original” version in Isaiah 42:1-3. I don’t know how insightful this will actually be, but I found these things interesting. In verse 1 of Isaiah, the scripture states “Behold my servant, whom I uphold; mine elect, in whom my soul delighteth.” In Matthew, it is quoted slightly differently as “Behold my servant, whom I have chosen; my beloved, in whom my soul is well pleased.” The differences are subtle, yet instructive. For example, we learn that, to the Lord, “elect is synonymous with “beloved.” Remember what the Lord said in the D&C “And ye are called to bring to pass the gathering of mine elect; for mine elect hear my voice and harden not their hearts” (D&C 29:7). Read in that light, we see that God is not only sending us out to gather the elect; we are sent to gather the Lord’s beloved. We become “beloved” of the Lord when we hear his voice, harden not our hearts, and come unto him. Another instructive difference in this scripture is the difference between “upheld” in Isaiah and “chosen” in Matthew. We have heard said in Church that the Lord qualifies those whom he calls. Remember Nephi and the Brass Plates? This is a variation on the same theme…when we are called by the Lord, he will uphold us. A synonym for “uphold” is “sustain.” When we sustain the leaders of the Church, we are furthering the Lord’s work and he is using us to fulfill his promise to strengthen and uphold those whom he has called. Jesus’s judgment is righteousness. And he shows it to us by sending his followers to us. Ultimately, by calling his Apostles and sending them out into the world, Jesus did indeed show the Gentiles his judgment. And to those who followed him initially, he showed them righteousness and judgment and mercy directly. Two more points from this scriptural comparison. Since probably no one will read this, I don’t need to worry that it’s boring, though! Notice in Isaiah 42:3 it is prophesied that Jesus would “bring forth judgment unto truth,” while in Matthew 12:20 it states that he will “send forth judgment unto victory.” Note that the judgment of Christ leads to truth, and as Jesus said, the truth sets us free. The mission of the Savior has been accomplished and results in victory over death and sin. Jesus’s truth is victory, and his victory is truth. Final comparison: Matthew 12:21 reads “And in his name shall the Gentiles trust.” You will notice that this verse does not appear in Isaiah. In Isaiah, the scripture goes on to describe how the isles of the sea shall await his law, and then moves on to other topics. So this prophesy that the Gentiles shall trust in the name of Christ is lost from our Old Testament. But it is also a significant verse. “There is no other name given whereby salvation cometh” (Mosiah 5:8). Thousands of years ago, Isaiah prophesied that the Gentiles would accept Christ and trust in him. And this is why I chose to focus on these verses as my topic this week. Jesus was not just the Messiah for the Jews, and he is not just the savior of the Mormons. He came to take on him the sins of the whole world and prepare a way by which we can overcome sin and death. And what does he require? As he said earlier, he requires that we come to him and learn of him. Jesus’s Atonement is more universal than we sometimes think. All who come to him, enter his covenants, and keep his commandments will find this salvation. They will be shown his judgment, his truth, and his example. They will taste his Ultimate Victory. And they shall become his elect and as such, his beloved. The promise is universal. However, like wishes, Salvation is true and not free. As with these stories discussed above, the impetus is on us to take that all-important first step toward God. The Savior stands with open arms, and no matter where we are on the journey of life, if our burdens are too much for us, we can always turn to him. I will conclude with one of my favorite sayings of Christ to the Nephites at the temple: “O all ye that are spared because ye were more righteous than they, will ye not now return unto me, and repent of your sins, and be converted, that I may heal you?” (3 Nephi 9:13). His arms are open, if we will just do as was prophesied by Isaiah long ago and trust in his name.